AppAnnie recently released their market forecast report. Revenue from mobile apps are expected to exceed $139 bn in 2021. That is a staggering amount, and is more than 3 times as large as the total annual revenue generated from global music sales last year. So what does that mean for app developers? While the revenue action has largely been concentrated around mobile games, this is expected to change in the next 4 years, where other apps expect to capture 24% of all the revenue, as opposed to 19% today. Games publishers clearly dominate the mobile user acquisition stage today, so it will be interesting to see how other players position themselves in order to drive revenue. I somehow doubt we will see Superbowl ads about productivity apps for instance, but you never know. While we have previously written about the huge potential in India, AppAnnie forecasts that revenues will not materialize in the same way, given the lack of purchasing power in that market. 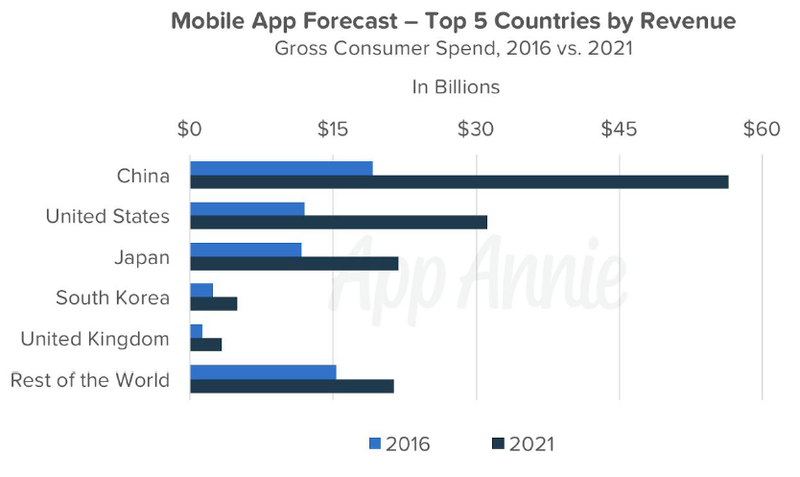 In fact, AppAnnie expects less than 2% of revenues will come from India in 2021. This does not mean you should ignore the market in India by any means, but it perhaps means you need to have different monetization strategies for different markets. All in all, the future looks bright for mobile apps usage and spending, but questions remain on whether the market is big enough for small as well as large players to survive.